PLACER COUNTY, CA (MPG) - Martha and Leah have been lifelong 4-H’ers and both have a heart for giving and serving others. The Humber family has been actively involved in Placer County 4-H for the last 19-years, with all five of the Humber children growing up in the program. They have learned many skills in their time; however, the one that resounds with the entire family is service to others. With their siblings aged out of the program, Martha and Leah are making their own way, through generosity, graciousness and sewing. Martha shares, “our quilting project started 4-years ago at the Auburn Grace Church Annual Jr. Sewers and Rippers Class”. She goes on to say that, she was inspired after attending the first class where they learned to make simple patchwork quilts which were sent to another country as part of a missionary connection. “Almost immediately, we (Leah and I), had the thought that some of the girls we know in 4-H have been to sewers and rippers and that we should start a project so we can make quilts together.” Through generous donations of materials and some helpful hints from their grandmother on how to bat their quilts more efficiently, Leah and Martha worked with their project and began making quilts to donate to Project Linus. 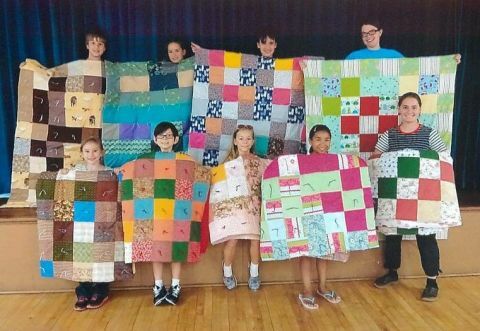 Over the last four years, their 4-H quilting project has donated hundreds of quilts and pillows to Project Linus, Sutter Faith Hospital, Kaiser and local new moms to help provide comfort and healing. Recently, Martha and Leah decided that they wanted to teach others how to quilt and outlined an Emerald Star Project that would help them spread their love for quilting and their world. This summer they offered a five day Quilting Camp where participants could take their basic sewing skills and learn to make a quilt and then donate it to either Project Linus or a child in Guatemala. An Emerald Star Project takes a lot of planning, including a presentation at the Placer County 4-H Council meeting where once presented, leaders and youth members can ask questions before voting for the youth to move forward. Martha and Leah let the kids know how big the quilt would be once finished and taught them how to lay it out and pin it. Leah states, “We didn’t tell them how to design it because we wanted them to be creative”. During the week, Leah shares, they worked on their quilts, played games, enjoyed snacks such as the homemade cupcakes that Leah baked and in the final days began sewing the rows they had carefully pinned together. “At the end of our five day camp we got all the quilts done and each of the children decided to send their quilts to Guatemala!” Leah adds, “Thank you to all who attended and supported us! I know that it was worth it and I can’t even imagine how much one of those quilts would mean to a child in Guatemala”. If you would like to find out how to enroll your child in Placer County 4-H or participate in the Countywide Quilting Project, please email placer4h@ucanr.edu or if you would like to help support the Placer County 4-H Countywide Quilting Project with quilting supplies or a donation, please contact Shannon Kane at slkane@ucanr.edu.